With an exquisite art-deco design, this short sequined holiday dress is an eye-catching style that is sure to make an impression at seasonal parties, New Year's Eve celebrations and Mardi Gras festivities. Fully-lined in soft jersey, this curve-hugging party dress features shimmering sequins in a geometric pattern on the sheer mesh overlay. 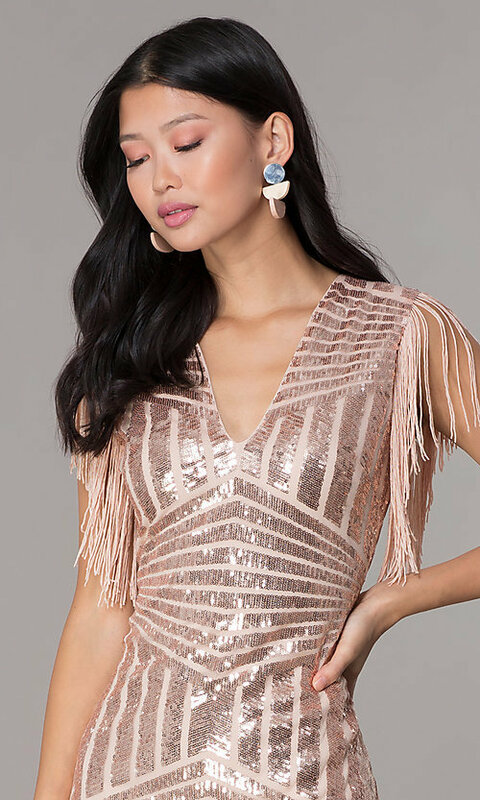 If the eye-catching sequins weren't enough, this lovely v-neck sheath dress has fringed short sleeves that create movement and a fun look. Sure to wow at semi-formals anywhere, the short sequined holiday party dress, under $100, is a budget-friendly choice with a bold look. The model wearing rose gold is 5'8.5".